Kitty Hawk Kites is the oldest and largest hang gliding school in the world, teaching since 1974. Choose from tandem discovery lessons and dune hang gliding lessons where you'll learn to fly solo on your first day! Dune Hang Gliding Lessons at Jockey's Ridge State Park are available all year. 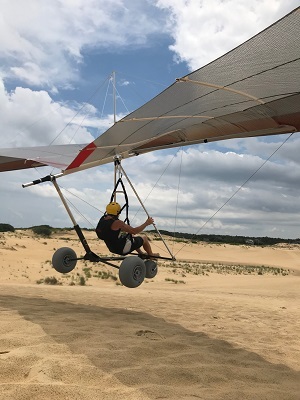 Learning to become a Hang Gliding pilot is one of the most rewarding experiences, and Jockey's Ridge State Park is one of the most versatile training facilities in the world for "Beginner" Free Flight pilots. Kid's Dune Lesson is designed for students that weigh less than 75 lbs. Roll into the sky! 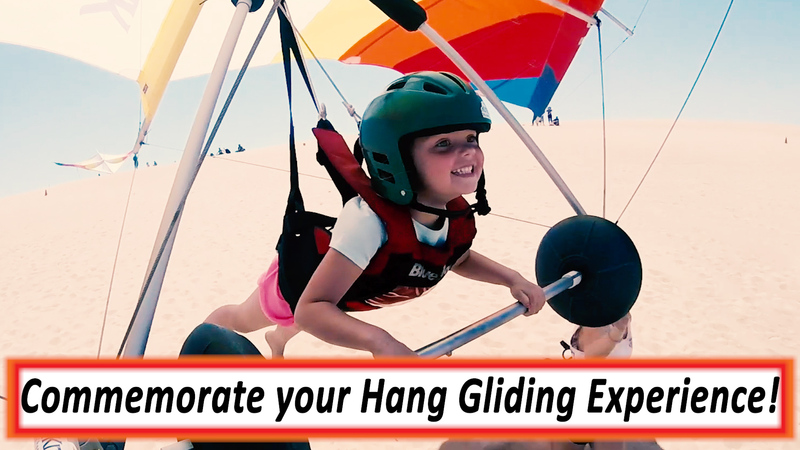 Sit in our custom built hang gliding cart and roll into the air! With the guidance of your instructor, you'll launch your glider by rolling off the sand dune, fly to the bottom of the hill and roll into land. Just like our traditional Beginner Hang Gliding lessons, you'll go through ground school and get 5 flights during your 3 hour lesson. It's the newest thing in hang gliding! This lesson is designed for students that have already completed ground school or taken the Beginner or Demo Lessons before, but not quite ready to start working toward their Hang 1 Pilot Rating. Ground school is not necessary to repeat, but you are welcome to repeat if you like. Each Intermediate student will receive at least 5 flights and will begin working on landing unassisted from their instructors while still using the base tubes. Students that are ready to go ahead and progress to Hang 1 Pilot training should sign up for Advanced Lessons after they've completed their Beginner Lesson. Advanced students should be prepared to carry the 75 lb glider up the hill since that is part of the Hang 1 competency. This lesson includes Ground School and 3 hang glider flights at Jockey's Ridge State Park with the assistance of our instructors. Upgrade to a 5-Flight Lesson for just $10 more! Spend your hang gliding lesson time flying! This hang gliding lesson focuses on developing and refining skills. 7 flights are guaranteed, and the student to instructor ratio is reduced to 4:1. The beginner dune hang gliding lesson is a pre-requisite. Get started toward your Hang 1 rating with ONE (1) Beginner Dune Lesson (that includes ground school) and ONE (1) Intermediate Dune Lesson. Purchase the Film & Photo Package to commemorate your Hang Gliding experience with Kitty Hawk Kites!